My FF is driving me crazy. At various times it will hog the CPU usage up to 25 and the whole thing then starts to go veeerrryyyy sloooooow. I have tried everything I can think of, turning off all extensions/add-ons and adding them back one at a time, updating everything, clearing cache. It still does it and it seems random. Like it started doing it yesterday afternoon and I'd have to force close to get FF to close. I'll re-open FF and it will be fine for as little as 2 or 3 minutes or as long as 30 mins then it does it again. It's doing it today too but it didn't do it at all last week. I pretty much go to the same sites everyday and they are pretty normal boring ones too. It just doesn't make sense that it will do it one day and not the next when nothing has changed. This is on my work pc so I'm wondering if it could be something they are doing? Anyone got any ideas on why this is happening? You could try disabling hardware acceleration. Last edited by Chuck; 2011-05-19 at 9:45. I thought I had done that but just checked and I hadn't. Thanks Chuck. Hopefully that will fix it. Well so far so good. I think that was it. Haven't had any problems in about 30 minutes and it was doing it sooner than that this morning. Thanks so much Chuck!!! You're welcome, hope that keeps on working. Hey chuck- I took that advise on my laptops too.. and it seems to have improved FF performance as well. I flagged this thread as inappropriate. This should have been under "Ask Uncle Chuck". 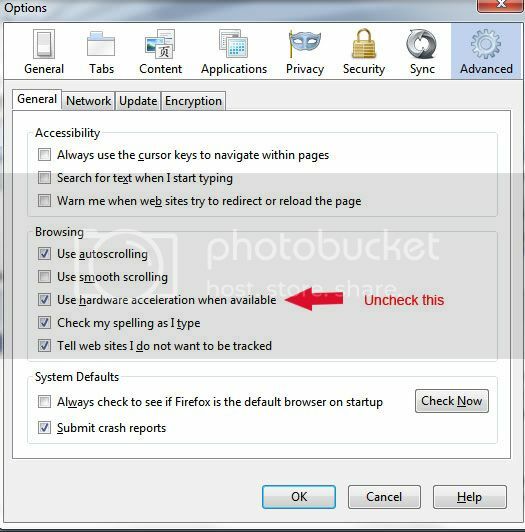 Uncle Chuck is da bomb...I have had this issue occur on my old PC from time to time, just lived with it. The new PC hasn't had it occur yet, but changed the setting just in case. Just changed the setting on my laptop. Thanks, Uncle Chuck! Well, it's happening again. I checked and that box is still unchecked but FF has started hogging the CPU again. Anyone got any new ideas? You have a plugin that is wonked. I don't know if they let you make new profiles anymore, but you could start in safe mode and disable all plugins that is a start. That and Firefox is still screwy about not releasing memory. They do a million things to it but the memory problem lingers. I still use Firefox but to be perfectly honest I get better speed and performance from IE9, yeah I know but it is true. FYI: If you are running Firefox 4 (not sure of other versions) you can go to the help menu and there is a selection to restart with addons disabled. I love Firefox, but it's the main problem browser for me. It crashes, it gobbles up resources, it doesn't play nice when there are other resource hungry programs running (Photoshop, Lightroom, and Firefox running at the same time, FF is the one that needs to be killed regularly when the system slows to a crawl). Why do I love Firefox? Thanks, I'll try the safe mode thing but I'm pretty sure I've done that in the past. What's strange about it is that it will do this for several days then not do it for several days. Very irritating.